The architecture of the mosque shows none of the features of mosques in North India. The reason for this is evident. 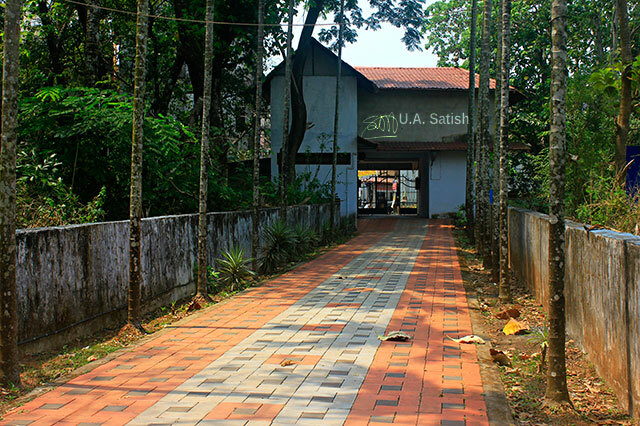 The workers who built the mosque modelled it on the temples of Kerala. The building is on three floors. There is a covered veranda running along the sides. The roof, doors and windows are of solid wood. You will not find any nails in the wood. The sloping roof has cladding of copper sheets. The copper has taken on a green colour. The rooftop has gold crowns. 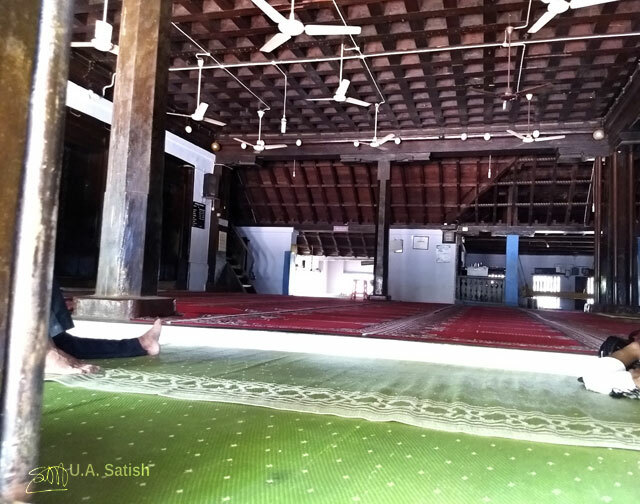 The large prayer hall has a wooden floor with mats on top. On all sides you will see wooden windows. We were allowed to go around the building and take photos. You will need special permission to get inside. 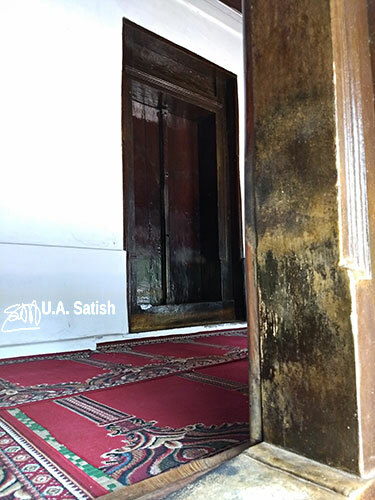 Ladies are barred from entering the mosque. 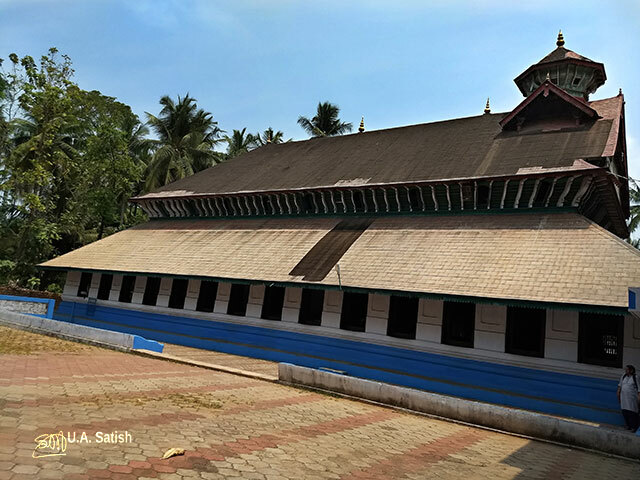 Moosakakka from Keyi family of Thalassery constructed Odathil Palli. He was a wealthy trader. His name was Moosa, but Gujarati traders used to call him Moosakakka. During the invasion of Tipu Sultan in Kerala, trade came down and business struggled. 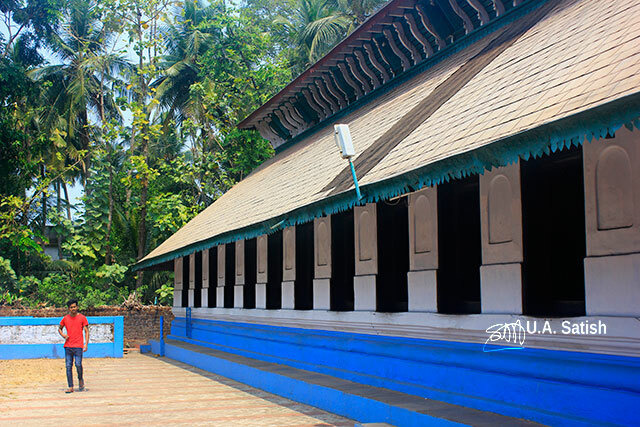 Moosakakka moved to Venad where the Maharaja of Travancore gave him financial help. His business flourished. After the fall of Tipu Sultan, Moosakakka returned to Thalassery. He built Odathil Palli on a land that he bought from the British. 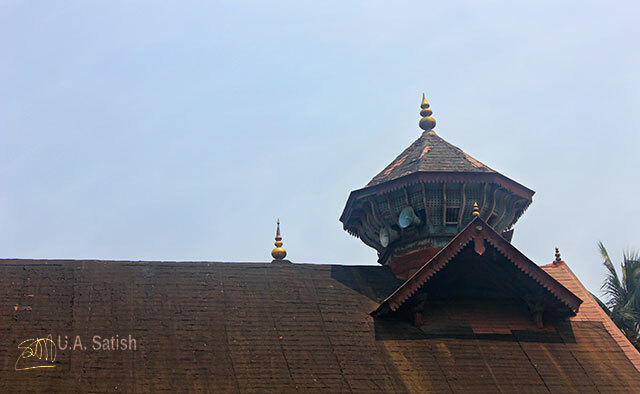 Maharaja of Travancore gave teak wood for the construction. 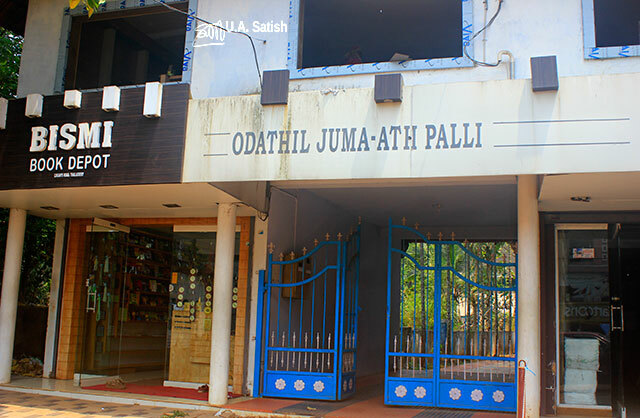 Odathil Palli is a 2 minute walk from Old Bus Stand in Thalassery. The town was famous for cricket, circus and cakes – the three Cs. The British had established a port there. However, after the ports of Kochi and Mangalore gained in importance, ships gradually stopped calling on Thalassery port. The nearest airport is Calicut International Airport. It is a drive of 93 km (2h 45min). If you have a question, please use the Contact Form to get in touch with me.